If you have a home that you are having built or just replacing your HVAC in Houston, there is a wide gamut of options for heating and cooling your home. Of course, being in Houston and the climate zone we are in, heating is not always a huge concern since we rarely see freezing temperatures. You are likely familiar though with the common furnace/air conditioner combo found in over 80% of Houston homes. However, in keeping with covering modern HVAC technology this month, we would like to bring your attention to an alternative to a big bulky furnace that might be a better fit for your home. If you are looking for something that is more fuel efficient than a furnace and is stable to heat your home, a heat pump might be the right choice for you? But you may not know anything about a heat pump as the technology might be very new to you. Not to worry, HVAC in Houston is sort of our thing, so let us break it down for you. What Is A Heat Pump & What Does It Do? Heat pumps are not old technology but not the newest either. They have however advanced quite a bit in efficiency over the last several years and offer some great advantages to a furnace. A heat pump is essentially a single unit that can not only provide heat but cooling as well. When your home needs to be heated or cooled a heat pump moves the air inside or outside of your home depending what your space needs—heating or cooling. The reason heat pumps are more fuel efficient and better for the environment is that they don’t burn fossil fuel to produce heat. Heat pumps have historically been primarily for warm weather climates such as Texas and the rest of the southern states that rarely see near or below freezing temperatures. This is because it used to be that heat pumps could not operate in regions with below freezing temperatures—but advancements in technology have changed that. However, we don’t have to worry about with HVAC in Houston due to our climate. Heat pumps are basically an air conditioning unit that can operate in reverse and provide heat during the colder months. In warm weather, heat from inside your home is absorbed by the pump and moved outside which cools the home effectively. In cooler weather, the process simply reverses and the heat pump brings heat from the air outside and distributes it throughout your home. Yes, that may seem illogical—extracting heat from the outside, in cold temperatures, you don’t believe it? Well, believe it. The truth is there is no such thing as “cold” it is merely a fabrication of our mind to define air that has little heat energy in it. In fact, air always contains heat, just at times, there is more of it. That being said, heat can always be extracted from cold air, but as far as heat pumps in Houston are concerned—it’s a lot easier to extract in milder temperatures like Houston. However, as mentioned earlier, newer heat pumps sold mainly in the northeast, do have advanced technology that allows them to operate in freezing temperatures as well. Even though there are several types of heat pumps there is really one main type of heat pump most often used in Houston. With regards to HVAC in Houston, the heat pumps often used here are Air Source Heat Pumps. They are called this because they literally use external air as their source for heat. This is most practical for urban and suburban areas with developed areas. Rural areas, on the other hand, can benefit from water sourced or geothermal heat pumps. These are complex installation because they use water pipes and heat from beneath the ground. They can be very efficient but are more practical in rural areas. Similar to a split system HVAC in Houston, a split system pump has an indoor distributor connected to an outside unit. Here is where it gets different. A split system heat pump uses evaporator coils to absorb heat and condenser coils to A split system heat pump has two parts: an inside unit and an outside unit, just like a traditional residential central air unit. The difference is, a split system heat pump has both coils that absorb heat (evaporator coils) and coils that release heat (condenser coils) in the inside and outside units. That means that a split system pump can both cool and heat from either the inside or the outside. This makes it very versatile in that it is essentially reversible. If you are installing in an older home where ducts are not an option—just as there are mini-split air conditioning units with distributors for each room, heat pumps come in mini-splits as well. When ducts are not feasible these ductless systems provide an energy efficient alternative. Be forewarned, however, that these ductless systems do not remove humidity as well as a ducted system and given Houston’s humid climate, we typically do not recommend them unless you plan on using a supplemental dehumidifier. What Are The Advantages Of Heat Pumps In Houston? The question you have been asking since the beginning of this article is about to be answered, we saved this part for last so you would know about heat pumps, not just their advantages. You have to know how they work and what they are good for before making a case for their advantage. That being said the advantages for Houston residents and our mild climate do add up. LOWER ENERGY EXPENSES: According to energy.gov, a heat pump in Houston can create almost three times as much heat energy for a given space than the electricity it uses. That means a significant reduction in your energy bill year after year. On average, a Houston home can save up to $1,000 a year! CHEAPER MAINTENANCE AND REPAIRS: Since you are using one system for heating and cooling, there is only one unit to maintain and one system diagnostic if something goes awry. This lowers the cost of ownership and makes maintenance fairly straightforward and easy to diagnose. FRIENDLIER TO THE ENVIRONMENT: Even though heat pumps use electricity to operate, they don’t use fossil fuels to heat as a furnace does. This does your part to reduce fossil fuel usage. Looking to upgrade your home’s heating and cooling but want to cut the costs down? Don’t feel the need for a big bulky furnace for a climate zone that rarely gets bone-chilling cold? 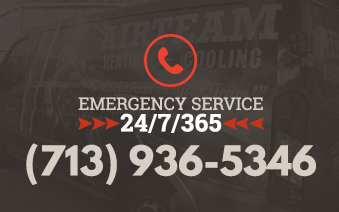 You need to contact one of our consultants today and have Airteam show you the options we have in quality heat pumps by Trane. Contact us for a free consultation!